Russell Ackoff (1997) coined the term systems mess to describe interrelated complex problems like the ones we often encounter in school change efforts. He also identified four types of system planners: inactivists, reactivists, preactivists, and interactivists. As he described them, inactivists are satisfied with the status quo; their planning efforts are about maintaining it. Nostalgic reactivists value hierarchical structures and “tried and true” solutions. Their change efforts are primarily focused on “undoing the mess they believe the planning of others has wrought” (p. 431). Preactivists anticipate change, and their planning focuses on predicting and preparing for it so they can capitalize on opportunities as they arise. Ackoff is transparent about his bias for the fourth type of planner. “Interactivists,” he says, “are not willing to settle for the current state of their affairs or the way they are going, and they are not willing to return to the past. They want to design a desirable future and invent ways of bringing it about” (p. 432). Ackoff’s interactivists are hopeful and idealistic. They engage in proactive problem solving and continuous, iterative learning. How many of us engaged in school change efforts would identify with this mindset? Number 12. “Constants, parameters, numbers (such as subsidies, taxes, standards).” Meadows wrote, “Parameters are the points of least leverage on my list of interventions. Diddling with the details, arranging the deck chairs on the Titanic. Probably 90 – no 95 – no 99 percent of our attention goes to parameters, but there’s not a lot of leverage in them” (p. 6). This is where most school change efforts happen. When we analyze test scores, deliberate over class schedules, adopt (or don’t) new standards, we intervene at this level. That work can make a difference, but Meadows argues, there are points of higher leverage. Number 4. “The power to add, change, evolve, or self-organize system structure.” One of the most important things to understand about complex systems including schools is that they self-organize, which means that parts of the system can create new structures and change independently of other parts in response to external and internal pressures. The hierarchy that in models (from my last post) looks like it defines the work of schools is really just the structure that contains it. Self-organization within that structure leads to new ideas, new problems, new innovations and solutions, all of which can pop up at any level in the system. Snyder suggests that we should foster a collaborative environment across organizations and create opportunities for continuous interactions and collaboration between players from different subsystems. In rolling out ideas, he suggests, policy makers should encourage experimentation at the local level and solicit feedback to inform an iterative process. He emphasizes the power of opening opportunities for institution-wide learning, which can grow outward from local areas. He suggests engaging teachers in collaboration, research, and peer-to-peer mentoring to promote ongoing professional learning and increasing interactions with less obvious partners, because effective solutions often come through partnerships with non-educational institutions (p. 28-29). The concept of Learning Organizations comes from systems theorist Peter Senge. In his collaborative book Schools That Learn, he writes, “It is becoming clear that schools can be re-created, made vital, and sustainably renewed not by fiat or command, and not by regulation, but by taking a learning orientation” (p. 5). What might this “learning orientation” look like in Vermont schools? Looking back at any one of the models of an SU in my last post, imagine zooming in to the school level. If the goal of the system is student growth, and learning is articulated in standards and other SU ends, then assessments must be designed to measure that growth in a variety of ways. Results of authentic assessments should inform professional development, which in turn should inform instruction, which should impact students. That impact can be assessed, starting the cycle over again. 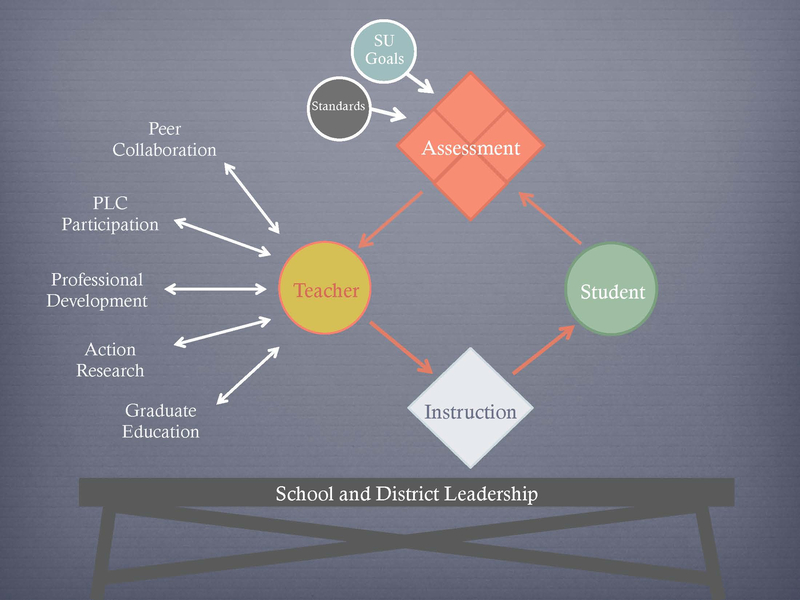 In this model, the purpose of school and district leadership is to support this type of iterative learning. Figure 1. Supporting organizational learning (Steele, 2013). Anthony Bryk takes this concept of learning systems and zooms out to look at school systems nested within communities and the broader context of school reform. In his keynote address at the Carnegie Foundation’s second annual Summit on Improvement in Education, he emphasized the need to recognize complexity in education systems, the importance of measurement, the value of iterative learning through cycles of inquiry, and the power of organizing networks of individuals and organizations, coordinating action, and developing collective learning (Donahue, 2015). Bryk and his colleagues’ concept of networked improvement communities could be particularly powerful here in Vermont. Partnerships between the Agency of Education, the Vermont State Legislature, colleges and universities, grant-making organizations like the Rowland Foundation, and – especially – local schools and supervisory unions, including teachers and students, hold a great deal of promise in a systems approach to change. For those of us engaged in the challenge of school system change, big ideas from the world of complexity theory and systems thinking can help us to wrap our brains around that work. It’s important to recognize that our education systems, at the state, SU, school, even classroom level, are complex. They are full of interdependence, guided by multiple sources of power and authority, so when working within a complex system, it rarely works to think in terms of simple problems (Kolbe & Steele, 2015). Rather it’s important to see challenges as interrelated and to expect the solutions we apply to have reverberations throughout the system. To make meaningful, systemic change in education we can take important tips from systems theorists like Senge, Snyder, and Bryk who advocate organizational learning, collaboration, and iterative, experimental change initiatives. We can use Meadows’s ideas about leverage points to identify places where we might intervene to effect change, and we can identify with Ackoff’s concept of the interactivist planner as we design the schools and learning opportunities that we want to define the Vermont education system in the years ahead. In January of 2015, I had the opportunity to travel with Dr. Tammy Kolbe to the Vermont State House in Montpelier where we presented to the Education Committee of the Vermont State Legislature on complexity theory and education policy. My earlier post, referenced several times above, was adapted from that presentation. I have enjoyed exchanging resources and ideas around complexity and school change with Dr. Kolbe since that time. Ackoff, R. L. (1997). Systems, messes and interactive planning. The Societal Engagement of Social Science, 3(1997), 417-438. Donahue, C. (2015). Learning our way into better education systems. Carnegie Foundation for the Advancement of Teaching. March 25, 2015. Kolbe, T. & Steele, C. (2015). Wicked vs. simple problems: Implications for education policy. Testimony on complexity theory and education policy presented to the Education Committee of the Vermont State Legislature. January 15, 2015. Meadows, D. (1999). Leverage points: Places to intervene in a system. Hartland, VT: The Sustainability Institute. Senge, P., Cambron-McCabe, N., Lucas, T., Smith, B., Dutton, J., & Kleiner, A. (2000). Schools that learn: A fifth discipline fieldbook for educators, parents, and everyone who cares about education. New York, NY: Doubleday. Snyder, S. (2013). The simple, the complicated, and the complex: Educational reform through the lens of complexity theory. OECD Educational Working Papers, No. 96, OECD Publishing. Steele, C. (2013). Facilitating student achievement: Leverage points in a Vermont supervisory union. Course term paper. Systems Analysis and Strategic Management. Spring 2013. This entry was posted in Research Directions and tagged complex systems, learning systems, leverage, school change by Caitlin S. Steele. Bookmark the permalink.